The original deadline of Dec. 31, 2018 has been extended. GOAL will continue to submit any tax credit applications that come through its website until we are notified that the 2019 cap has been reached. Your participation is more valuable than ever! Invest in the GRACEPOINT community and help provide student scholarships by simply contributing to the Georgia GOAL Scholarship Program for a 100% Georgia income tax credit. You will make a positive impact on our school, in our community, and across our state! Your participation will allow us to admit excellent, deserving student applicants to our school. We ask that you “go for the GOAL” and help us continue to empower students to reach their potential and achieve their dreams. On the first business day of January 2019, GOAL begins submitting applications to the Georgia Department of Revenue (DOR). GOAL and DOR notify you of tax credit approval and amount in January/February 2019. Pay GOAL by check or credit card within 60 days of DOR approval (mid-March 2019). In May, GOAL will send you a Form IT-QEE-SSO1 (tax receipt) for claiming the credit on your 2018 Georgia income tax return (Note: you will take the credit when you file your 2019 taxes in April of 2020). Please contact Sheletha Drew at Sheletha.drew@gracepointschool.org with any questions. Thank you for your support of GRACEPOINT School! 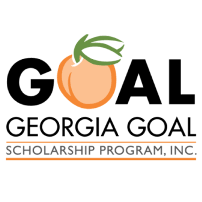 Read here as a GRACEPOINT parent shares her appreciation for the GA Goal Scholarship fund. "My daughter spent the first part of second grade crying every morning when she had to go to school. She had always loved school but now she had fallen too far behind. During this time, we discovered she has Dyslexia and in turn, we heard about GRACEPOINT. We had never planned on private school. But through the process, we learned she needed GRACEPOINT, a private school with private school tuition. I was just a public school teacher and our family did not know how God was going to make a way, but we knew He would. The Georgia GOAL scholarship for our family was an answer to prayer. The Georgia GOAL scholarship is the ONLY way our daughter could attend GRACEPOINT. It was the way God showed us we were on the right path, His path and plan for her. GRACEPOINT is the school environment she needed to thrive! She loves school again and I am so thankful. She is reading more than I ever imagined and is so confident. GRACEPOINT has been life-changing for my daughter and our family, and it was all made possible because of people who participated in Georgia GOAL."